I love beauty oils, there is something so luxurious about them. They usually smell so good, are a treat to apply and make your skin radiant and healthy looking. Here are my top 5. 1. Weleda Citrus Refreshing Body Oil: I picked up this one to use as a moisturizer in the Summer. It smells fresh and delicious and is perfect as a quick body moisturizer. 2. Now Organic Sweet Almond Oil: I bought this to put a few drops in my son's bath in the Winter and have been using it for myself as well. Lip balm, face moisturizer, cuticle oil, you name it, it works. 3. Kiehl's Midnight Recovery Concentrate: I have been using this dry oil/serum on my face for years and I love it. It's my night moisturizer of choice in the Summer, as it is not too heavy or greasy on the skin. 4. The Honest Co. Organic Body Oil: I bought this to use on my belly after I had my son and love it as an all-body moisturizer. 5. Nuxe Huile Prodigieuse: I have been using this cult product for years and absolutely love it. The scent is amazing, it's a great body moisturizer but in a pinch I also use it on my face or as a hair serum. I should probably have mentioned coconut oil as I use it a lot on my face, hair, and body but I figured since it's solid in the jar and all, it doesn't quite qualify for the glistening and luxurious category. 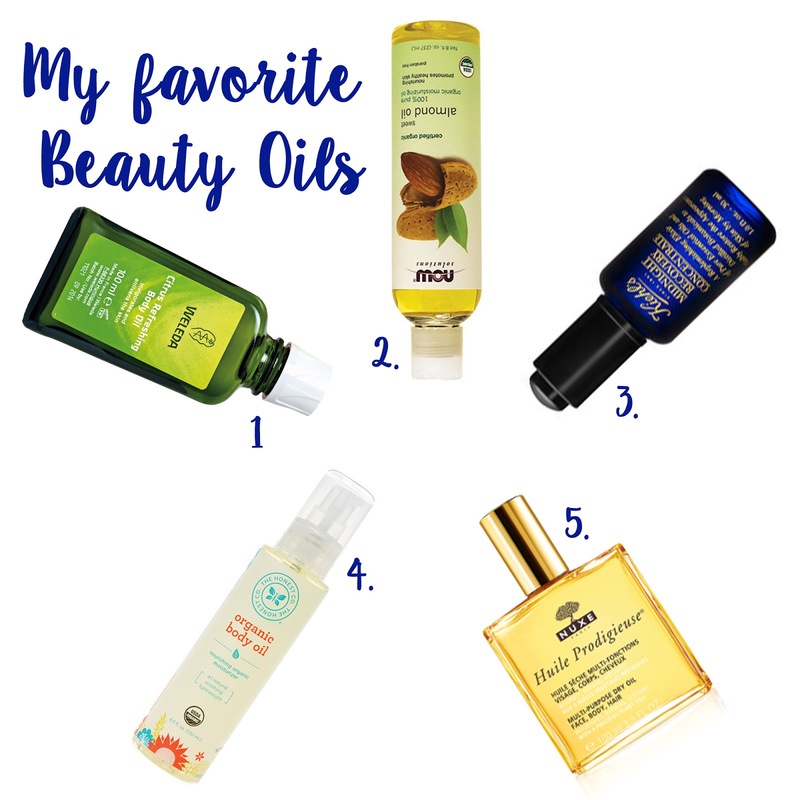 Do you use oils in your beauty routine? Very interesting blog you reveal it is rather useful tools you find us really. It's wonderful you have massage for back pain revise it.many thanks.